If you have children, you might like to know that not only is acupuncture safe for kids, it is a powerful healing modality that can address a wide range of children's health issues naturally and holistically. Acupuncture and Chinese medicine can help you to avoid or break the cycle of the endless treadmill of antibiotics, and can also work in conjunction with Western medical treatments for an integrative approach. I have spent the past four years undertaking extensive advanced training in Chinese medicine pediatrics, have worked with many children to bring about wonderful results (including my own!) and can offer gentle, pain-free treatments to your child in a safe and nurturing environment. A recent study reviewed 31 pieces of published research on the safety and efficacy of acupuncture in children. They found that not only does acupuncture for children have an extremely low risk of serious adverse effects (0.00001% - which is dramatically lower than the risk of many commonly used OTC medications) but the incidence of side effects is extremely low and inconsequential, whilst the evidence for its effectiveness is high. Read the research yourself here. Firstly we will have an indepth discussion of the child's health history and current complaint. All aspects of your child's health are taken into consideration, including physical health, diet, environment and emotional wellbeing. I may or may not look at your child's tongue or pulse as these methods of diagnosis are not as reliable as when used with adults. What happens next really depends on the age of the child. A wide range of treatment modalities can be used, as discussed above. If the child is old enough, I will introduce the idea of acupuncture by showing them a needle, and demonstrating “taps” (a non-threatening term to refer to acupuncture treatment) on the treatment table, a doll or toy, on myself and/or yourself, the parent! Then I will ask if your child would allow us to give them a “tap”, and give them a choice of points to start with. If this goes well, I will continue doing “taps” on a small number of acupuncture points. If a child is not old enough to understand a demonstration such as described above, I will still explain what we are about to do for both yourself and your child, and proceed directly to 'taps' and other modalities. This is a very common question, and the short answer is no. Most of the time, acupuncture is virtually painless, especially for kids. Pediatric acupuncturists are trained to use a special technique using extremely tiny needles – they are so fine that they are about the size of a strand of hair. For kids under 8 years old, the needles just go quickly in and out, so they don't even have to hold still for more than a few seconds at a time. An acupuncture needle might occasionally cause a very small amount of discomfort, but this typically only lasts a few seconds. What if my child doesn't want to have needles? Using these tips, you can gently introduce the idea of acupuncture to your child before you arrive. Once at the clinic, if your child doesn't want to try “taps”, we can move straight onto a range of non-needle techniques and again, introduce each one by demonstrating and explaining what they do. I understand that not every child will want to have acupuncture, and I will never force a child to have an acupuncture treatment. There are plenty of non-needle techniques that I can use that are easy, painless and have a similar therapeutic effect to acupuncture (they just work a little more slowly). I aim to build a sense of trust and rapport with your child, so that even if they don't want to try the actual “taps” at first, they might be more amenable to the idea after trying a few different modalities or at the next appointment. The aim is to make the process as gentle, considerate, respectful but also effective as possible, by remaining flexible and responsive to the individual circumstances. If you have any questions, or are curious about what acupuncture can do for your child, please do contact me. 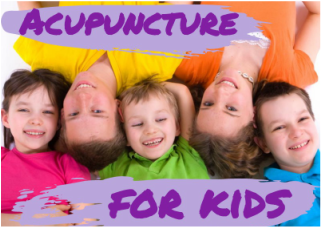 I am passionate about acupuncture for kids, have so much knowledge and experience to offer, and would be very happy to help you along the path of natural healing for your family. I have a current Working with Children Check for your peace of mind - WWC1587641E.